A Republican who’s never faced a Democratic challenger in the last four times he’s stood for reelection is presenting himself as a potential challenger of Democratic Governor Culver’s reelection in 2010. Representative Rod Roberts of Carroll is about half-way through his fifth term in the Iowa House. "I have the distinction of 44 Republicans in the Iowa House, as I understand the numbers, of having the least-friendly Republican district in Iowa," Roberts says, "and yet in four reelection cycles I’ve run unopposed." Roberts intends to form an "exploratory committee" this summer, which means he’ll be able to raise money for a campaign for governor. Roberts says Republicans need to think carefully not just about the party’s message, but about the messenger they choose to carry it in 2010. "We know that we have a challenge in reaching out to independent and Democrat registered voters," Roberts says. "But friends if we nominate someone who is friendly, approachable and engaging, and willing to work with others and do it in a way where you can still stand solid on your beliefs and convictions, then we can have a winning combination of messenger and message." According to Roberts, one of the Democratic governor’s biggest liabilities is the level of state spending. Roberts say Governor Culver needs to get "real" about the state’s budget crisis. "Instead of wishing for a better day which right now our governor seems to say, ‘Let’s just all wait and things will get better if we just wait and hope for better times.’ That’s not what Iowans want to hear," Roberts says. "They want to hear from the governor and from other leaders in state government, ‘We do have a problem and we need to address it now and prepare for the future.’"
Roberts argues the state will face an "unprecedented" $1 billion spending gap by January. Roberts says it’s time to downsize, reorganize and streamline state government. "When it comes to those who lead in government, whether you’re a governor or a legislator, be real with Iowans. Don’t beat around the bush. Don’t ignore the challenges and the problems that are before us," he said. "Be truthful, be upfront and be real about the issues that we are facing." Roberts says now is an "unsettled period of time" and that gives Republicans an opening in 2010 because voters appear interested in "a change in direction." Roberts, who is 51 years old, is a Waverly native who graduated from the Iowa Christian College in 1980. He currently lives in Carroll and serves as development director for Christian Churches and Churches of Christ in Iowa. 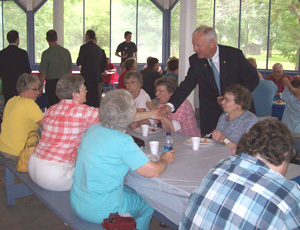 Roberts was first elected to the Iowa House in 2000 and he has begun to travel the state, presenting himself as a "potential" candidate for governor. "Iowa can do much better and we need someone who can lead in the position of governor," Roberts says. Two other Republicans — Bob Vander Plaats and Christopher Rants, both of Sioux City — formed "exploratory committees" this spring and have begun raising money for a race for governor.